Meeting Date and Time: The Board meets the third Thursday of the month at 7:00 pm. The Zoning Code is the Town’s guide to use of Eden properties, and is intended to provide uniformity and clarity in our Town’s development. The Zoning Board of Appeals has jurisdiction under New York law to hear and decide appeals from decisions of Town officials who apply and enforce the Zoning Code (for example, denial of a building permit). The Board may address and correct specific cases of hardship under the Zoning Code, by granting variances when appropriate. The Board also has jurisdiction to grant certain permits in the first instance. The Board cannot write new law or amend the Zoning Code – that authority resides in the Town Board. The primary goal of the Zoning Board of Appeals is to give property owners a fair review of decisions made under the Zoning Code. The Town Board appoints Zoning Board Members for staggered terms of up to 5 years. Pursuant to the provisions of Section 267 of the New York State Town Law, the Town of Eden maintains a Zoning Board of Appeals consisting of five (5) members and one secretary appointed by the Eden Town Board.The Zoning Board of Appeals is authorized to grant relief from any provision of the Town of Eden Zoning Ordinance or any decision of an administrative official charged with the enforcement of that ordinance. In addition, the Board is empowered to grant special use permits in certain instances as specified in the Zoning Ordinance. The Eden Town Law specifies the grounds and criteria that the Zoning Board of Appeals must use to grant a variance. 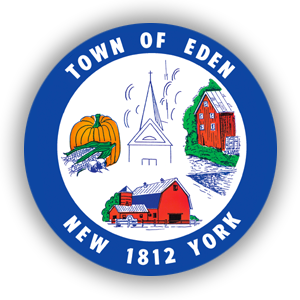 Applications for variances can be obtained from the Town of Eden Building Department, 2795 East Church Street, Eden, NY 14057. Hearings by the Zoning Board of Appeal are held once a month, generally the last Thursday of the month. All petitions are public hearings where anyone who wishes to speak are given that opportunity. The decisions of the Board are public record and can be reviewed in the Eden Town Clerk’s Office. The Zoning Ordinance of the Town of Eden, New York (Chapter 225 of the Town Code) has 11 zoning classifications. The following is a list and general description of uses allowed. Please refer to the Code for the Town of Eden regarding specific uses and actions allowed in these districts. For each district listed below, a set of bulk regulations are applied. These regulations vary depending on the intensity of the proposed use and the infrastructure present to serve the use. Agricultural: Low density residential and agricultural uses, deliverer of development rights in a transfer of development rights actions. Conservation: Low density residential and agricultural uses. Mobile homes not allowed. General Industrial: Manufacturing, industrial and commercial uses. Planned Industrial: Office and Light industrial uses. General Business: Business and Office uses. Rural Residential: low density residential uses. Hamlet Residential: Full range of residential uses. Suburban Residential: Low and medium density residential uses. Suburban Residential, Restricted Use: Low and medium residential, restrictions upon accessory uses.